To reach the peaceful living space is always the desire of each person. Lived in the fresh air of bichetii grass and the soft-delicate flowers is the most beautiful dream of everyeone at City Garden apartment. Built at the front of Ngo Tat To street, adjacent to satellite urban areas, so people who living in City Garden apartment will enjoy all the most modern and high-class facilities with a civilized and high intellectual community. That is very suitable for demand of long-term settled in City Garden apartment of Vietnamese as well as foreigners. Lived in the fresh air of bichetii grass and the soft-delicate flowers is the most beautiful dream of everyeone at City Garden apartment. The distance from City Garden apartment to District 1 is only 500 meters and to center of District 1 is 1.5 kilometers. That is too convenient and makes the satisfation and comfort for you. In here, you also can connect quickly to District 1 and Binh Thanh District. Especially, traffic jam rarely happens, so residents of City Garden apartment will easily go to attractive places around such as Van Thanh park, Him Lam golf club, zoo, Metro station, ... as well as enjoy the international standard amenities at the neighboring comdominiums such as Vinhomes Central Park, The Manor, Saigon Pearl, ... and it only takes few minutes to drive by taxi. - Location: 59 Ngo Tat To street, Ward 2, Binh Thanh District, Ho Chi Minh City (near Thu Thiem Bridge). - The employer: R.C Real Estate Development & Finance Corporation. - Number of buildings: 6 elliptical towers. - Number of apartments: 927 apartments. - Number of floors: 21 – 30 floors. + Soho (69-72m2) – City Garden one-bedroom apartment. + Cosmopolitan (102-117m2) – City Garden two-bedroom apartment. + Metropolitan (140-145m2) - City Garden three-bedroom apartment. + All rooms are designed to receive the light and wind from nature and have wide view. Beside the luxurious furniture, around City Garden apartment is a lot of facility areas with a minimum radius of 500 meters such as nursery school, junior high school, high school, commercial services, sport services, space of leisure and entertainment, ... These facilities are reasonably designed, interwoven space creates apartment with high aesthetics. City Garden apartment has a 50-meter pool with a mini pool bar, a gym room has view to swimming pool and garden with modern equipment and poolside restaurant is an ideal place to enjoy the warm space with family and friends. Swimming pool at City Garden apartment. City Garden apartment always meets the needs of rest and tranquil but safety by the isolated gate which intends for residents. City Garden apartment is also designed with 5-star standards of amenities such as big green garden, playground for children, supermarket, restaurant, cafe, kindergarten, medical center, spa, fitness club, .... Especially, City Garden apartment has private access for car and pedestrian to ensure the safety for residents. Modern and advanced equipments such as 24/24 security system, fire alarm system, … are indispensable standards in each condominium and City Garden apartment isn’t exception. 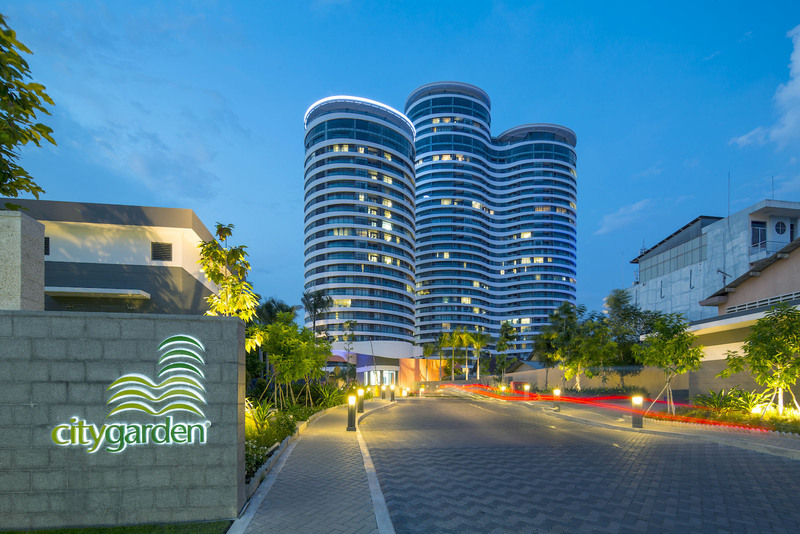 Why is City Garden known as the green paradise in the heart of the city? 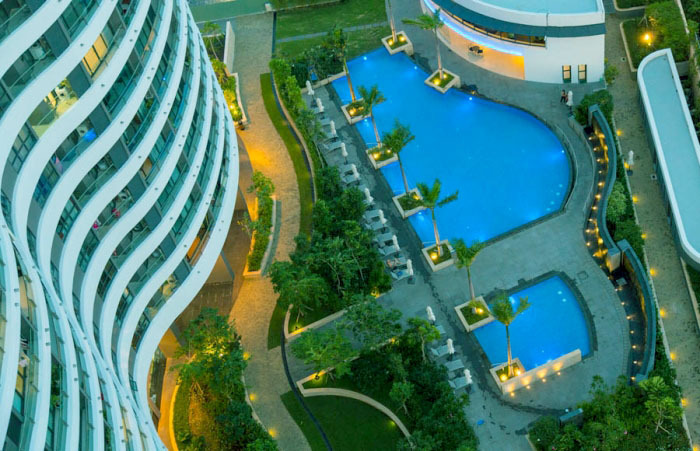 City Garden has total area of 23.000 sqm including 17.000 sqm of green gardens, swimming pool, turfs, footpaths, … were designed by Belt Collins Company (American company). The high desity of tree not only helps to keep the pure atmosphere but also becomes an umbrage to prevent solar radiation for residents and especially children who have soft skin. The plant also absorbs posion gases from car fumes, dirt from factory or trash, so this purifies air and reduces environmental pollution. When living in the City Garden apartment, you haven’t to worry about your health in the heart of Ho Chi Minh city. 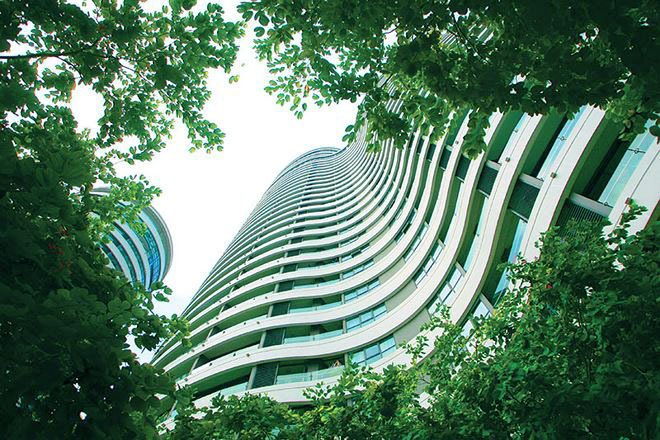 Green space in City Garden luxury apartments. City Garden apartment will become the best stopover place for you, it brings the quiet and modern space and ready to serve wherever you are. Don’t hesitate to contact us immediately to experience the high-class amenities as well as pure space that City Garden apartment brings. You will be free in visting and consulting by our professional group in real estate consultants and ready to serve you anytime with our sincere heart.